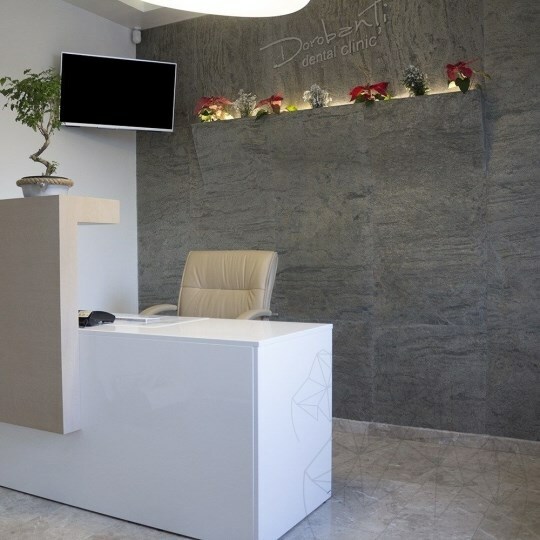 Wallpaper is a decoration material suitable for residential areas but also offices, hotels or cafes. One of its selling points is the fact that it is easy to apply, which recommends it as a practical solution. Besides, wallpaper made a comeback as a solution for interior decoration projects following an extended period of ignorance. A fashion trend of the 70s, with drawings and colors specific for that period, wallpaper returned to fashion with the introduction of new materials and textures. 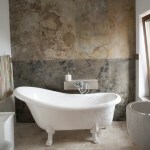 What about decorating your house with a natural stone wallpaper? Forget everything you knew about natural stone and the image of a raw, heavy and not malleable material! The 80s establish a new trend in interior decoration: the launch of flexible slate. An innovative product that would transform our perception on natural stone. 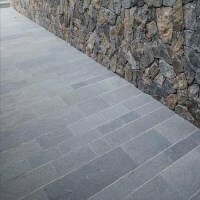 Until that time natural stone was considered natural material that was raw, heavy and not malleable, but from that point on barriers were rejected and slate is perceived differently, due to its most important feature – flexibility. SKIN flexible slate becomes the ideal solution for curved, atypical surfaces. 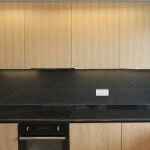 What is SKIN flexible slate or "natural stone wallpaper"? SKIN flexible slate is a revolutionary and unique product for Romania. Produced from the most amazing slate blocks, it uses a revolutionary method which allows the production of many layers of natural stone from a stone block of 5 tonnes. When applied on the back of the SKIN flexible slate, the fiber backing has liquid shape and the slate sheets can be peeled by hand. 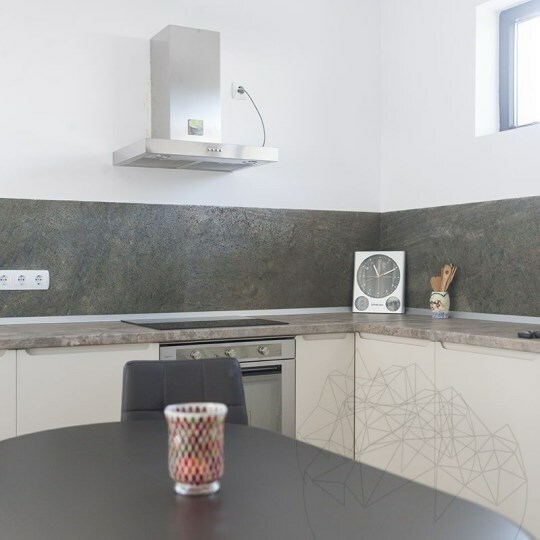 The production results in a natural stone sheet with 2 mm thickness and 1.5 kg/sqm weight, thus reducing transport costs and the pace of exhausting natural stone resources. 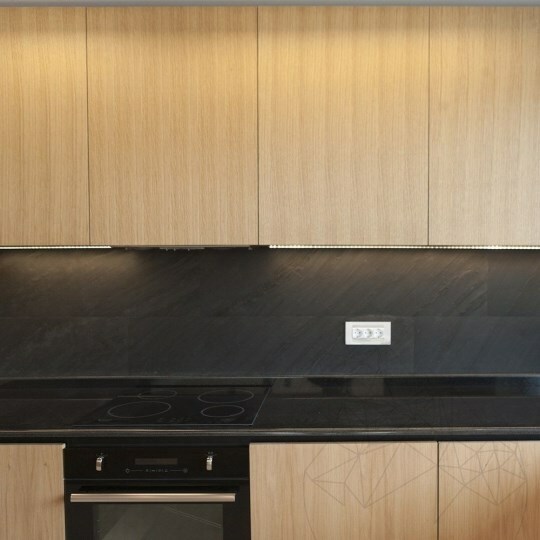 SKIN flexible slate sheets can be installed on almost any surface – wood, MDF (medium density fireboard), particleboard, concrete, ceramic surfaces. 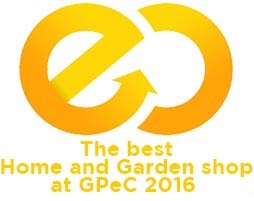 Forget everything you knew about natural stone and discover the new and original SKIN product range. Classic wallpaper or flexible slate? 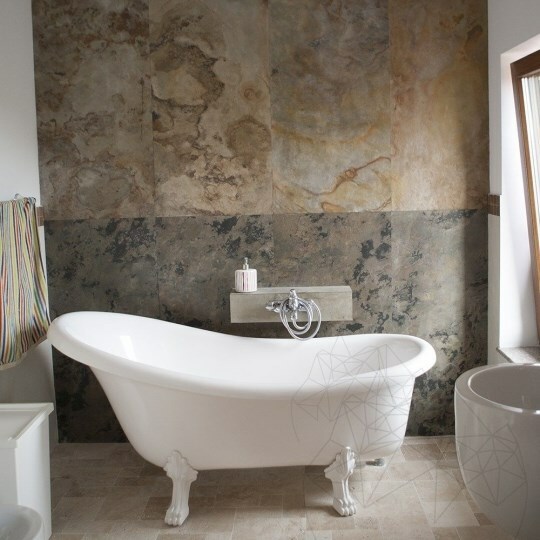 Compared to this natural stone product, the wallpaper from paper, fiberglass or vinyl has an infinitely larger number of models and textures, yet it has its disadvantages. 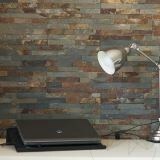 First, any other type of wallpaper is obviously more sensitive to moisture, which does not happen with SKIN flexible slate since this can be successfully installed even in wet spaces. Moreover, during installation, an ordinary wallpaper may rip apart because of adhesive moisture. 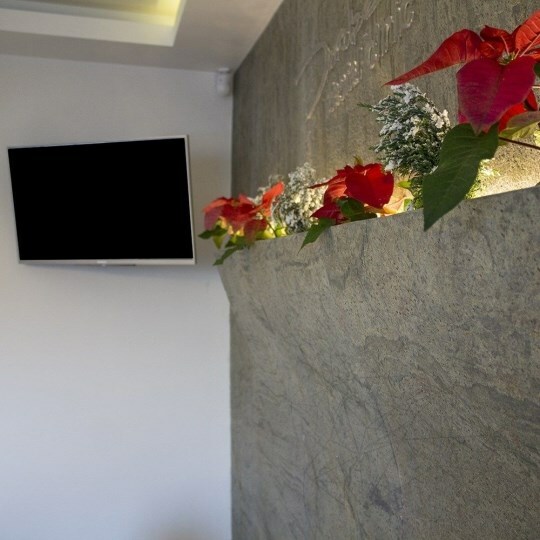 The washable or semi-washable wallpaper prevents the ventilation of walls, considerably decreasing ventilation pace, which leads to development of fungi on surfaces. Second aspect is the fact that, in time, the color of standard wallpaper will fade away, when subjected to direct sunlight; also cleaning is more difficult and quite expensive compared to benefits. You cannot compare standard wallpaper’s acoustic and thermal insulation with SKIN flexible slate. 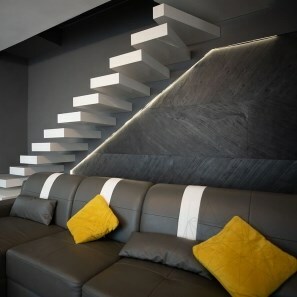 SKIN flexible slate is the clear winner in terms of advantages and properties – a light, malable material, resistant to stain, scratching and sunlight and most important is the fact that this is a natural material, a piece of nature for your house. 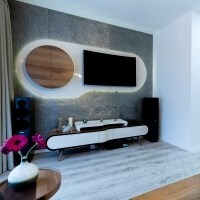 Wall cladding with flexible slate is quite and you can do it yourself with a couple of DIY tools. However, what about this installation procedure? Cleaning and stripping the surface before installation (removes dust, dirt and water). Checking the underlay for stains. Analyze stains and clean if possible. Water stains are responsible for local malfunction of the cladding. Use detergent from the LTP product range for cleaning and removing stains. Clean slate sheets with water and allow them to dry for 24 hours. 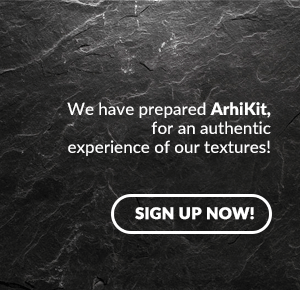 Handle the flexible slate sheets with great care, to avoid surface scratching. Select the sheets by laying them out for choosing the model you want. For flooring projects, lay out the sheets before installation, by matching colors with your preferences. Measure the surfaces and estimate the consumption of sheets, establishing a procedure for the sheets that need to be cut. Measure and mark the necessary cut-outs with adhesive tape (use tape for avoiding the scratching of slate). Have the initial procedures ready: turn off undefloor heating, install backlighting (for translucent slate), level the surface, waterproof surface with professional products etc. Mark the contour of surface to be cladded, laying out the sheets, 1:1 scale. For curved surfaces use paper sheets or other flexible material, same size as the sheet, outlining the surface by overlapping. Choose the adhesive, depending on the type of surface and installing conditions (interior or exterior project, temperature and humidity). Always test adhesive before use. Using a putty knife, apply adhesive on the back of the sheet, then brush surface with a notched trowel. Overlay the sheet on the outlined surface, then glue. It is recommended to start installation from the center, continuing to the edges. Pay maximum attention to curved surfaces for matching the sheet exactly on the outlined surface. Use a paint roller for removing the air under the sheet; move the paint roller from the bottom up for cladding projects and from one side to another for flooring projects. Don't press it hard though, because adhesive might stick out from the surface to be cladded. Install the sheets with or without joints; narrow joints are recommended, considering the low thickness of sheets; for large sheets, with approximately 5 mm thicknes, the joints will not exceed 4 mm. Remove excess adhesive with a damp cloth. Cut sheets for areas where full size sheets cannot be installed, observing the marks on the adhesive tape. Cutting can be dry or wet. For dry cutting (usually used for thin sheets and small pieces) you can use grape shear or an electric tool for manual cutting with tungsten and diamond blade (e.g. a wood cutting tool). 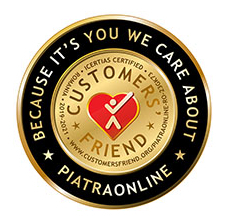 Wet cutting (use machines with water for washing discs) is recommended for large and thicker sheets (5mm). Finish the cut edges with sandpaper. Glue the pieces, using the same procedure explained before. Allow adhesive to dry according to the manufacturer's specifications. Avoid walking on recently installed flooring. Grout the joints, applying adhesive tape on edges for protection before grouting. We recommend weber.color and the many available shades. Waterproof the surface with LTP solutions. We recommend individually waterproofing each sheet before installation or in the end for the whole surface. Small joints will not seal separately but large joints do. 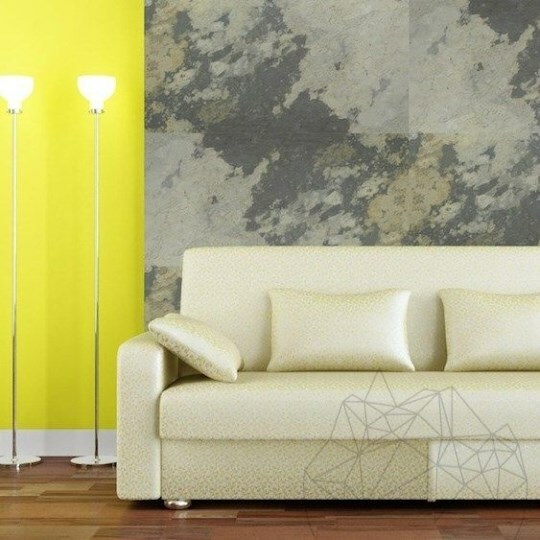 This new type of natural stone wallpaper is much more durable, with 100% surface of natural stone and more than 18 models to choose from in the SKIN product range. 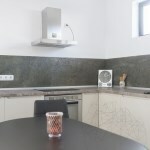 Visit our website to discover the new SKIN flexible slate and enjoy the natural stone universe!